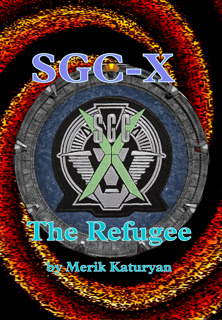 Blurb: This first of 2 volumes of Stargate SG-1 fan-fiction introduces two new characters to the cast. One of them, the British mathematician Dr. Harold Trajan, is an established SGC specialist, who has a history of joining SG teams on expeditions through the stargate. The other is another version of Samantha Carter, who arrived from an alternate Earth, which was conquered by the Goa'uld. The new arrival is the subject of both suspicion (is she a Goa'uld spy?) and fascination, as she knows slightly different versions of the staff of the SGC. She also possesses information from her work at her SGC, which is new to those serving at her refuge. Dr. Samantha Carter, who never joined the US Air Force, is a specialist in spacecraft systems and she appears to have much to offer. Confined to the SGC by Pentagon bureaucracy, she has to convince the doubters of her bona fides and come to terms with life among people whom she has almost, but not quite, known for around four years.